The route marked in red through the Frenchgate which is now closed overnight and the route marked in yellow, which campaigner Mr O'Brien says is 4-5 minutes longer and caused him to miss his bus. The centre's mall linking St Sepulchre Gate with Doncaster railway station on Trafford Way has historically been kept open at night to allow passengers to catch trains. Signs on the doors at the Frenchgate show passengers the new route. 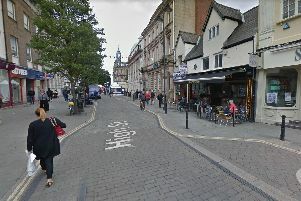 But in recent weeks, bosses at the shopping centre have locked the doors between 8pm and 7am over what crusader Andrew O'Brien claims he has been told are 'security issues' and he says that passengers heading for the transport interchange now face a longer walk, outdoors along West Laith Gate. He says the route through the mall is an historic right of way, dating back to when the centre opened as the Arndale Centre in 1968, and launched the battle to get bosses to re-open the stretch, which is approximately 100 metres in length. Said Mr O'Brien: "It came to light when I had been out in Doncaster for the night a few weeks ago. I went to catch my bus and found the doors locked. "By the time I had walked the much longer route along West Laith Gate, I had missed my bus and that made me pretty angry. Parts of the Frenchgate have been historically kept open at night. "I'm sure there will be lots of people who have been in a similar position and won't be happy about the route being closed." Before the closure, people using the route at night would enter the shopping centre through the doors alongside Crawshaws butchers and exit at the other side along Sainsbury's before using the pedestrian crossing on Trafford Way to reach the railway station and transport interchange. The new route sees travellers passing the Tut 'n' Shive pub on West Laith Gate, passing the rear of Sainsbury's and using the same crossing to complete their route to the station. Added Mr O'Brien, 51: "To older and disabled people, that route isn't acceptable. It is outdoors, it is about four to five minutes longer and it isn't a nice or safe route to take in my opinion. This entrance is now closed overnight - but Mr O'Brien wants it re-opening. "Can you imagine having to walk that way on a cold winter's night? "I've been doing some digging and found that it is an historic right of way and by rights, they have to keep it open. That dates back to when it first opened as the Arndale in 1968. "When I complained they told me it was because of security issues in the current terrorist climate but frankly to me, that sounds nonsense." "They are getting away with blue murder and it shouldn't be allowed. Those extra few minutes walk can make all the difference between missing and catching a bus. I have walked that way since I was a little boy. I'm sure I can't be the only one who thinks this is wrong and an inconvenience?" The longer route Mr O'Brien past the Tut 'n' Shive pub passengers now have to take. Mr O'Brien has taken his battle to the Frenchgate, Doncaster Council and Mayor Ros Jones to get the route reinstated. Since launching his battle, Frenchgate bosses have agreed to extend the time the route stays open to until 10pm. Paddy Mellon, general manager at Frenchgate, said: “We are working with Doncaster Council and other agencies with regards to the 10pm closures of the south and north mall entrances. "As a result we have extended the centre’s St Sepulchre Gate entrance from 8pm to 10pm, seven days a week. “The rail doors are open until the last train at 1.30 am and access to the bus station via this route is also available, with the last bus at 11.30pm, which can be accessed via the pedestrian crossing on Trafford Way. The exit from the Frenchgate to the railway station which is now closed overnight.